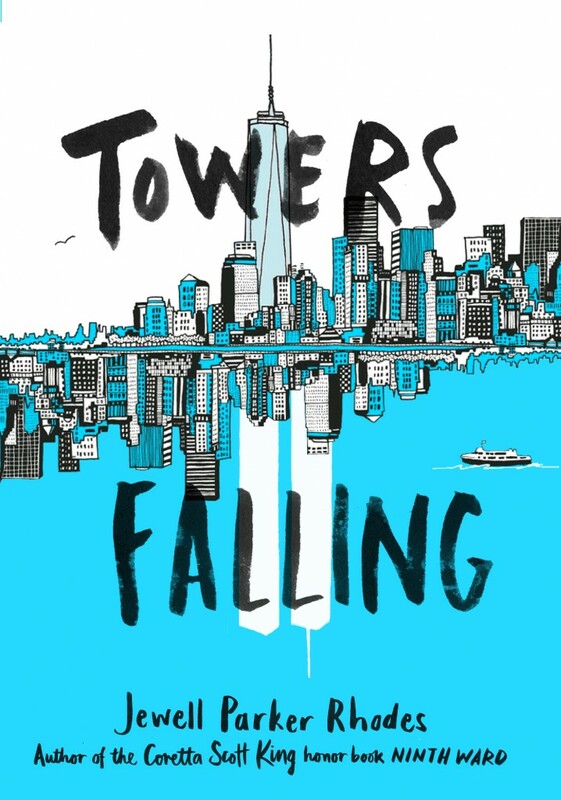 Towers Falling, my novel for middle grade readers focuses on three friends: Sabeen, a Turkish American Muslim girl, Ben, a booklover and soldier’s son, and Dèja, a homeless girl who doesn’t know her father’s damaged lungs and her family’s subsequent poverty are because of his 9/11 heroism. When Dèja and Ben cut school to visit the 9/11 memorial, Sabeen gives them a metal container of baklava to take on the train. The baklava is meant to be a sweet gift to offset Dèja’s tension-filled search to find out what happened to her father in the Twin Towers. The Turkish baklava recipe reminds Dèja and Ben of Sabeen’s Turkish and Muslim heritage and that she is a supportive friend. However, Dèja, too nervous to eat the baklava, gives the food to a homeless man who, in turn, shares the food with the other train passengers who represent America’s diversity. So while Dèja and Ben are off on a mysterious adventure, the train passengers bond over a sweet dessert, one that reminds readers of America’s multi-culturalism and how food serves as a bridge to build community. Food historians agree that phyllo dough originated in Turkey. Turkish pistachios have a small, slender shell and are a natural splendid green inside. 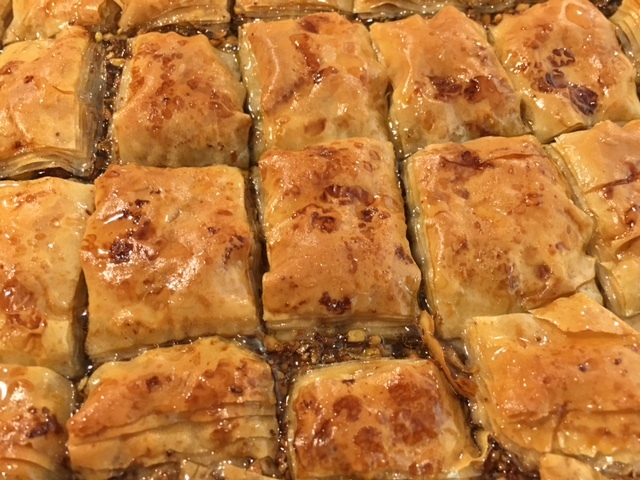 This traditional Turkish baklava made with pistachios and sugar syrup brings a taste of Muslim culture to book clubs discussing Jewell Parker Rhodes's TOWERS FALLING, about a group of young students born after 9/11 trying to discover the meaning of the attacks. In a food processor, pulse the pistachios until coarsely ground (or you can chop them by hand until very finely chopped). Don’t overprocess the nuts. You want to maintain some texture. Clarify the butter by melting it over low heat, then letting it cook until the foam rises to the top and the milk solids fall to the bottom of the pan. This will take about 5 to 15 minutes depending upon how high your heat is, but don’t rush it or the butter could burn. Skim foam off the top of the melted butter. Line a fine-mesh sieve with a piece of cheesecloth, place it over a bowl and pour the melted butter through. Heat oven to 400° F. and brush the inside of a 9-by-13-inch baking pan with a little of the clarified butter. Prepare the phyllo dough by trimming the stack of it with scissors to fit the bottom of your baking dish. Packages of phyllo come in different sizes; some won't need any trimming, some may need an inch or two cut off a side, and some may need to be cut in half crosswise. Cover phyllo layers with a lightly damp kitchen towel, and keep covered. Place 1 piece of phyllo on the bottom of the baking pan; brush lightly with clarified butter. Layer phyllo sheets on top, brushing each sheet with butter as you go, until half the phyllo is used. Spread pistachios on phyllo in an even layer, then layer with remaining phyllo, brushing each sheet with butter as you go (rewarm butter if necessary). Cut the pastry into 36 pieces, using clean up-and-down strokes and rotating the pan if necessary. Make sure to cut all the way through to bottom of pan. Pour any remaining butter evenly over pan. Bake baklava until the top is golden brown, and the lower phyllo layers beneath the pistachios are thoroughly baked through. To test this, use a knife to lift up a corner of one of the pastry rectangles from the center of the pan so you can peek at the bottom layers. Start checking after 40 minutes, but it could take up to an hour. If the top starts to get too brown before the pastry is cooked through, lay a piece of foil over the top. Meanwhile, prepare sugar syrup: In a medium pot, combine sugar with 1 2/3 cups water. Bring to a boil, then let simmer for 10 minutes, until slightly thickened. Stir in lemon juice. Set aside to cool. When the baklava is baked through, remove pan from oven and place on a rimmed baking sheet to catch any drips of syrup. Slowly pour sugar syrup over the pastry. Move pan to wire rack to cool completely. Serve at room temperature.